---- >>>> In 2010 ARASIA led an action with the Sumatra Orangutan Society (SOS) to plant 800 trees in the damaged habitat of the Sumatran orangutans. 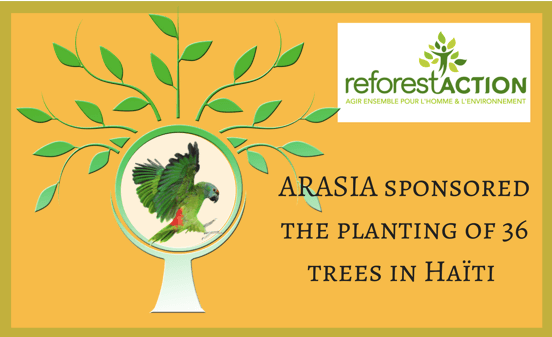 More information..
---- >>>> In 2015, ARASIA launches a new partnership with Mass-Education to plant trees in the Sundarbans, at the feet of the Himalayas. This action contributes to the protection of the Royal Bengal Tiger, a species unfortunately threatened with extinction. --- >>>> We also sponsored the planting of 336 trees in partnership with Reforest'action, including 300 in India and 36 in Haiti. "Man is the only species that has the power to destroy the planet, but also the duty to protect it!" "Planting a tree is a strong and concrete act for the protection of the environment." "We have only one planet, it is our future and that of our children."